The Monetary Authority of Singapore’s (MAS) recent introduction of the Payments Council in February 2018 is one such example. The Payments Council is being set up with the aim of developing strategies that would drive increased adoption of e-payments. A second aim is in working towards the inter-operability between e-payments and non e-payments solutions providers to develop a more coherent framework. Electronic payments, or digital transactions, have been defined by the financial education website as "…a seamless and non-traditional system involving one or more participants, where transactions are effected without the requirement for cash." Singapore’s push towards e-payments is one of five national strategic projects under its Smart Nation initiative. Lee Hsien Loong, Singapore’s prime minister in his National Day Rally speech chided Singapore for “trailing behind other cities” in terms of e-payments adoption despite possessing the right ingredients to become a Smart Nation, according to reporting by Channel News Asia. According to reporting by The Straits Times in 2017, SMEs in Singapore, for one, have expressed a reluctance to accept e-payments in part because of the additional fees that are imposed on mobile wallets, similar to credit card fees since these are layered on existing credit card infrastructure. Meanwhile, on the user end, only 3% of Singaporeans used e-payments services on a regular basis, compared to 48% of Chinese, according to a survey conducted by Paypal among 4,000 respondents in Asia Pacific nations in 2016. 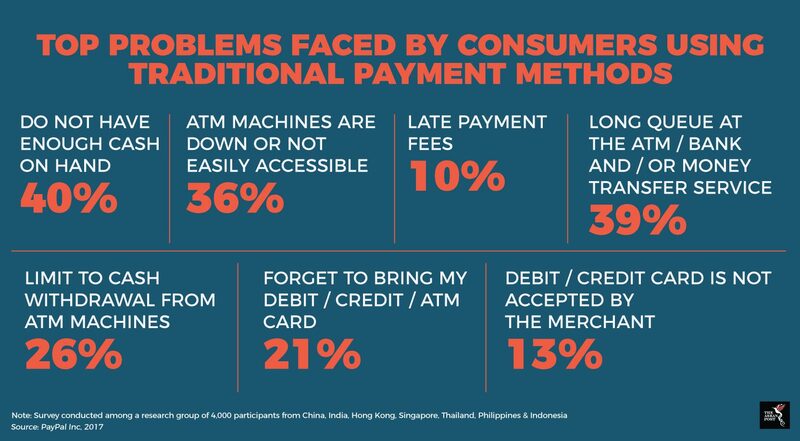 Out of those who did not conduct e-payment transactions, 51% cited privacy concerns as their main reason for non-adoption, while 36% said e-payments systems were too complex for them to handle with ease. Singapore's new Payments Council would comprise of 20 leaders from the banking sector, trade associations and businesses who would serve in advisory capacities regarding e-payments implementation, according to an announcement made by the Monetary Authority of Singapore (MAS) in February 2018. Regulating e-payments is one way to encourage user adoption. If users are confident of the e-payments infrastructure, which encompasses security and data privacy, they are more likely to see the benefits rather than just the risks of trying out e-payments services. Malaysia’s push towards e-payments, meanwhile, is in part an attempt to reduce the cost of using cheques, which was estimated to be around RM484 million in December 2017, according to Australian banking and advisory firm, East & Partners analysis at the time. Malaysia is similarly setting up the Inter-operable Credit Transfer Network (“Network”), to be operative by July 2018, in an effort to connect banks to eligible non-bank e-money issuers. Muhammad bin Ibrahim, Malaysian central bank governor, outlined the objectives of the Network in a keynote address at the 2nd Malaysian E-payments Excellence Awards held in 2017. In practice, the Network will also include operators like Singapore’s PromptPay and Thailand’s PayNow, which allow e-payment transactions to be made so long as a mobile phone number, identification number or QR code is provided. As part of the safeguards accompanying this scheme, banks and other non-bank e-money issuers are required to process all inter-bank credit transfers through shared payment infrastructures. The establishment of an accompanying National Addressing Database will also link bank and e-money accounts to common identifier information such as identity cards or company registration numbers. This would minimise the risk of fraud and foster greater confidence in users. Regulation also needs to clearly define when transactions begin and end in order to minimise financial risk and thereby foster user confidence in e-payments. Thailand’s new Payment System Act, which comes into effect in April 2018, will consolidate the previous network of fragmented payment laws and regulations, and will, among other things, provide a definitive meaning on the point of finality of payments. According to Tilleke & Gibbons, "…finality is the point at which the transferring party has irrevocably lost access to the funds, and the receiving party has irrevocably gained access to the funds." In the draft Bill, credit transfers have to be carried out on the same day, and may not be revoked or amended. Settling the point would help increase certainty on all sides with regards to when fund payments have actually been cleared for use. Financial institutions traditionally place 'holds' for a period on payments received for the finality of payments but this approach would not work with respect to instantaneous e-payments. Singapore’s Monetary Authority on the same day (13 February) also announced the launch of a public consultation on proposed guidelines to protect e-payments users, scheduled to run until 16 March, 2018. According to the MAS website, such guidelines will include the responsibilities of e-payments users to safeguard their own online security, as well as requirements for financial institutions to set clear resolution processes in the event of erroneous or unauthorised payment transactions being made. As ASEAN countries continue to move towards greater digitisation of their economies, it is inevitable that the need for greater regulation increases in tandem. All this needs to be done in the interests of facilitating the long-term reliability of future financial systems, thereby ensuring future economic stability. It is pertinent that as many safeguards as possible be put into place now, because the financial world is moving faster than we think.